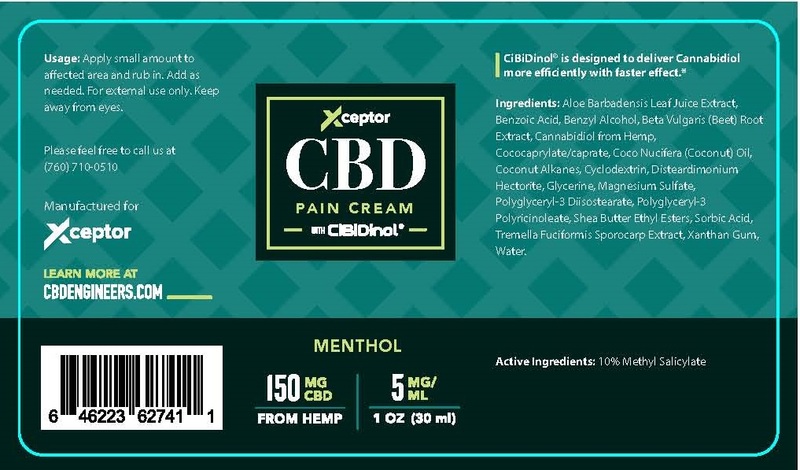 Proprietary Name: Xceptor Cbd Pain Menthol What is the Proprietary Name? Non-Proprietary Name: Methyl Salicylate What is the Non-Proprietary Name? Xceptor Cbd Pain Menthol with NDC 72519-104 is a a human over the counter drug product labeled by Xceptor Llc. The generic name of Xceptor Cbd Pain Menthol is methyl salicylate. The product's dosage form is cream and is administered via topical form. TOPICAL PAIN RELIEF FOR MINOR ACHES AND PAINS. FOR EXTERNAL USE ONLY.KEEP AWAY FROM EYES. APPLY SMALL AMOUNT TO AFFECTED AREA AND RUB IN. ADD AS NEEDED.